That Sebastien Gonzalez defeated Juan Martinez de Irujo in the Cuatro y Medio final last Tuesday is now rather old new; forgive me for the late telling of it, which has occurred due to foreign trips and singing work getting in the way! This was a huge upset. Gonzalez had played excellently in the run up to the final, losing only to Titin III in the semi final rounds and indeed defeating his final opponent en route. However, the trumping of Irujo in a major final is a big deal. The man from Ibero adores the big stage and when his tail is up, to say that he is formidable is a gross understatement. Gonzalez had a mountain to climb and he scaled it with aplomb, holding his nerve and maintaining his belief to pull off by far the biggest win of his career. Gonzalez could have become fatally disillusioned from the gun as Irujo roared to a 6-0. It looked like business as usual for the Pairs and Manomanista Champion. However, Gonzalez clawed his way back to 7-10 and seemed to pass his early nerves to Irujo, who became uncharacteristically rattled. When Gonzalez inched ahead at 12-11 it was very much game on. 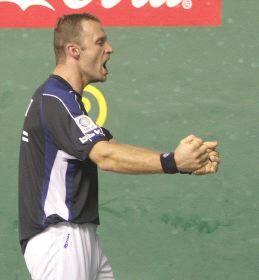 Irujo’s mental state was further dented by a disputed line call which sparked a heated protest, but he held his game and the players enetered deadlock at 16-16. When Gonzalez retook the lead at 18-19, the dream for the player from the Lapurdi province in the French Basque Country looked to be on. As he grew in stature, the great champion Irujo waned and with five straight points Gonzalez reached the pinacle of his career to date. This was a first major title for the 32 year old, whose only previous championship win had come in the 2nd Division Manomanista in 2000. For Irujo it was a final hurdle failure to win all three major titles in one calendar year. He will be consoled by finishing the year with a commanding lead in the Manista.com rankings over nearest, and perennial rival Olaizola II, but this defeat surely hurt. Irujo was gracious as ever in defeat but it was Gonzalez’s evening; for this astounding coup, he deserves the freedom of Saint Jean de Luz. Scoring sequence: 6-0; 6-1; 9-1; 10-2; 10-7; 11-7; 12-7; 12-9; 12-11; 14-11; 15-12; 16-12; 16-16; 17-17; 18-17; 18-21; 18-22.